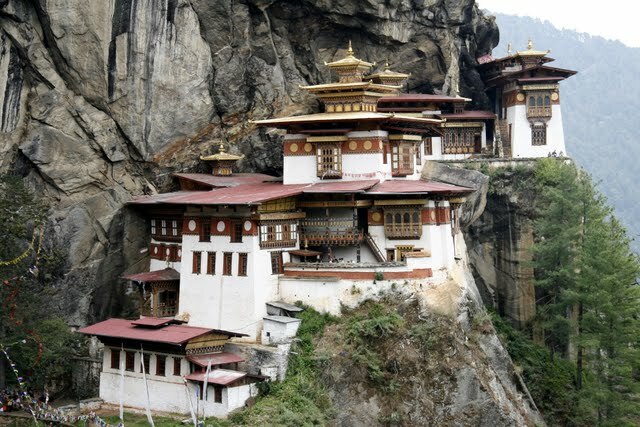 At half-way, there is a government built cafeteria that offers a clean view of the monastery. You will be served tea/coffee with amazing cream-cracker-like biscuits, and on the way back can also choose to have lunch here (not recommended for Indians). The journey from this point gets a little difficult: first you have to walk up a steep path, then walk down 500 steps and finally climb another 200 to get to the temple. With some motivation from Chibu & Kinley, I agreed to go. Some of the photos taken on the way are perhaps the best ones from the trek. Most of the steps have no railings, so you really need to be careful. Before you descend the 500 steps, you are at a point that is right opposite the monastery; they could have a bridge. In fact, several people have suggested, volunteered and even contributed to building a rope-way to get up there. But the Bhutanese love Bollywood, and totally believe in ‘kuch pane ke liye kuch khona padta hai’. They believe that nothing comes easy, and that the pleasure of visiting such a holy & refreshing place and getting close to God, should only come after some effort. As you begin to climb again, you pass-by a very scenic bridge behind which is a waterfall; I even climbed the rocks there. In fact, the way up wasn’t as difficult as the hype created. Chibu went all the way up and I got a distant picture of him. Kinley told us that coming down (starting with climbing 500 steps) was going to be quick and easy. To our surprise, despite of stopping-by at several places to take pictures, we reached only 40mins after our parents. They had waited at the cafeteria for a while, and then started to walk down. Another Japanese couple, the man who closely resembled Mohan kaka, had passed by at the point where the 500 step descend starts, and only gone half-way down since. All in all it was fun. We really didn’t get short of oxygen, neither was it too cold at the top. The key to enjoying this trek is to go ‘slow-and-steady’. We drove back to town where we had a decent Indian meal. We also confirmed our return tickets at the Druk air office which spans just 2 leased buildings. Kinley stopped by at the range to catch-up a game of archery which is Bhutan’s national sport. On a Wednesday afternoon, there were four teams and a hundred spectators watching it. One of the persons approached me and asked where I was from, in good Hindi. He asked if I had seen any movie stars in Mumbai – every other Bhutanese will ask you this if you say you’re from Mumbai. He was upset with Kareena for not finding a Hindu guy for her, and was abusing Sania for her Pakistani act. As we drove back to hotel, Kinley very sadly informed us that our tour was over!